Mauricio Claver-Carone, a vocal critic of the Obama administration’s engagement with Cuba, is taking over as the National Security Council’s influential director for Latin America policy. In another personnel shake up at the White House, Cuban American exile, Mauricio Claver-Carone, will take over as director of the National Security Council's office of Western Hemisphere Affairs from Juan Cruz, a highly regarded career CIA officer, the Miami Herald reported. The White House has yet to make an official announcement but a former U.S. official confirmed to Univision that Cruz was stepping down. Raised in Orlando, and son of a Cuban mother and Spanish father, Claver-Carone, formerly led the influential U.S. Cuba Democracy PAC which took over from the Cuban American National Foundation as the most powerful Cuban exile lobby group in Washington DC.. He is close to Florida's Cuban-American congressional delegation, Senator Marco Rubio, Representatives Carlos Curbelo, Mario Diaz-Balart and Ileana Ros-Lehtinen, as well as New Jersey Senator Bob Menendez. A staunch advocate of the long-standing U.S. embargo against Cuba, Claver-Carone is part of a house cleaning at the National Security Council after John Bolton, a foreign policy hawk, took over the policy-making body adjacent to the White House in March. 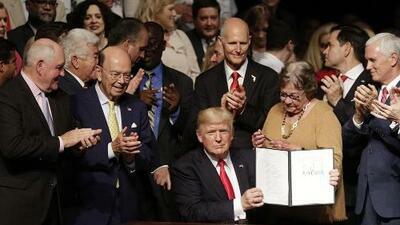 The appointment won immediate praise from hardline Cuban American exiles who supported President Trump's walking back last year of the Obama administration's rapprochment with Cuba. "I'm extremely happy to hear this," said Remedios Diaz-Oliver, co-founder of the US-Cuba Democracy PAC. "Mauricio is one of the smartest people I know and he knows Latin America very well," he said. "At long last, someone is going to be in the White House who understands that place [Cuba] and the leftist regimes plaguing it," wrote Monica Showalter in the American Thinker, a conservative daily online daily magazine. "That's horrible news for the Castro oligarchy in Cuba, the Ortega dictatorship in Nicaragua, and the Chavista narcothugocracy of Venezuela whose days of pulling tricks on gringo and getting away with crap are now over," she added. A lawyer by training, after the 2016 election Claver-Carone worked on the Trump transition team and is currently the acting U.S. director at the International Monetary Fund (IMF). He previously worked at the Treasury department. Claver-Carone widely disliked by Cuban exile moderates who favored Obama’s efforts to improve U.S. relations with the communist-run island. He also wrote an influential blog, Capital Hill Cubans, advocating the democracy and human rights in Cuba and deriding those who advocated for a softer policy of trade and engagement with Cuba. Critics say that while he is an undisputed ideological expert on Cuba policy, he lacks experience in the rest of the hemisphere. Earlier in his career he taught at The Catholic University of America's School of Law and also at The George Washington University's National Law Center.